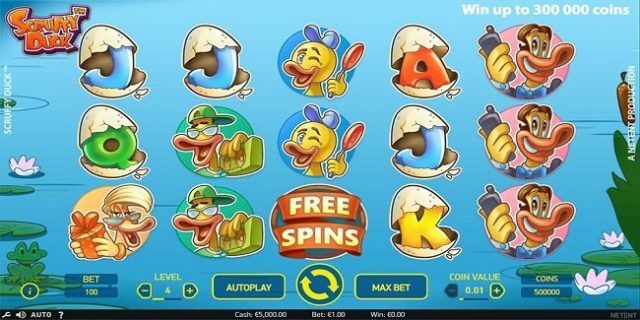 Scruffy Duck slot is 5 reels and 25 paylines video slot game powered by NetEnt software platform. Minimum coins per line are 1 and maximum is 10, while coin sizes are 0.01 to 1 per spin. Return of the player is 96.68%. You can play Scruffy Duck slot at any Net entertainment casino. This game includes symbols like ducks and other water-bird characters. Expanding Wild Ducks and other free spin feature will be beneficial for you as a player. This slot contains options such as “Level” to set the number of coins to bet on, ‘Coin Value’ to set the coin size and “Max bet” is used to set the maximum bet that the slot allows. The “Auto Play” option in this game can be used to Set the reels in motion without interruption for a chosen number of times and “Spin” option is used to set the reels in motion for a selected wager. The wild symbol in this game is the white Duck, which can be the replacement for any other symbol on reels except the free spin logo. There are three wild symbols from which players can be benefited such as Expanding Wild, Colossal Wild and the Random Wild. The Free spin feature will be triggered if you land on 3 free spins symbols simultaneously on any active reels and that would provide you free spin. During this free spin feature, 15 Free Spins will be activated for multiplier feature, Colossal Wild will provide you 10 free spins.